Surgent CPA Review was recently named the #1 course for 2017 by Crush the CPA Exam, the industry’s leading review site. We awarded Surgent CPA Review with this award after thoroughly reviewing all of the available products in the CPA test prep space. 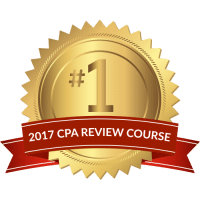 Crush the CPA Exam, the industry’s most trusted review company, did extensive research before giving Surgent CPA Review this great honor, as we took into account a number of considerations that were the basis for our Best CPA Review Course rankings. After learning of the AICPA’s move to make the CPA Exam more focused on higher-order skills and job-oriented blueprints, Surgent got to work developing the most relevant review materials possible. The company took a fine-toothed comb to every release from the AICPA and set to making its 2017 CPA Exam prep course mirror what students would face come testing day. If you want the industry’s #1 CPA review course for 2017, look no further than Surgent CPA Review. The Surgent CPA Review team welcomes you to see exactly why they deserve this award. Don’t wait any longer to become a CPA—use their great product and get studying today!